Min here, from The Bad Girl’s Kitchen. Long time no see! I was lured over here yesterday by Melynda’s Apricot Pie, if you must know. Then I just had to come back over and share my new creation with you!! This recipe came about when I received an email listing “summer salads.” There was a link to a recipe someone had called “Loaded Baked Potato Salad,” which I thought sounded great…but when I read through the recipe, it was really a casserole…?! What do I mean by “casserole?” It was a potato dish that was assembled and then BAKED in a 9×13 pan. Sort of reminiscent of my Twice Baked Potato Casserole, actually. Totally not a “salad” at all, (salad in my mind means “cold”), and certainly not a dish I would think about serving in the heat of summer. I set out to create a true potato salad. First, I used my grill to bake the potatoes. I just clean them, rub them with olive oil, then grill on the top rack over medium-ish heat for about one hour, turning over halfway through. You want them baked but not too soft, keep in mind your grill may cook differently than mine. Remove potatoes from grill and let cool before chopping, of course. I found that using a serrated knife helps the potatoes hold together better, while keeping the skin pieces intact. Once salad ingredients are prepped, it’s important not to mix it until you’ve added everything, because the potatoes are a bit fragile. You want to gently fold the ingredients together. I used a mixture of sour cream and real mayonnaise because that’s what I prefer. The real mayo adds a bit of flavor you wouldn’t get with sour cream alone. You need to put this salad together ahead of time, and I’d recommend chilling it in the refrigerator for at least an hour or so if you have time. I have to tell you, this is an amazing potato salad! Make it for your next barbecue, and everyone will be impressed! I think the baked potatoes add so much to the flavor compared to a traditional potato salad made with boiled potatoes, that I may actually try to bake all my potatoes for salads from now on. My family and I loved this potato salad; in fact my oldest son H-Bomb even asked for seconds although he’s not a huge potato fan. It’s my new favorite, and I’m going to make more today! Reserve a few pieces bacon, some green onions and cheese to use as garnish. Use a serrated knife to gently chop potatoes, leaving skin on. I cut each potato in quarters lengthwise, before chopping in pieces. Add to large mixing bowl. Add bacon, onions and cheese; do not mix. Season with salt and pepper. Set aside. In a small bowl, mix sour cream and mayo. Add to potato mixture and mix gently with a rubber spatula. Taste and adjust salt and pepper, if needed. Refrigerate until ready to serve. Before serving, garnish with reserved cheese, bacon and green onions. 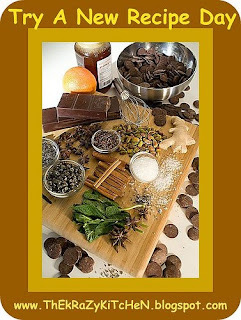 I also host the fun monthly food blog event, Taste & Create! Please join us! – Try a New Recipe! 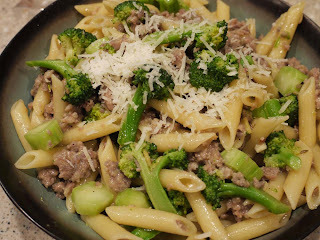 Pasta with Broccoli and Sausage – Try A New Recipe! I don’t recall ever trying one of Emeril’s recipes before. I could be wrong, but I know I don’t have any of his cookbooks, and I just can’t think of one that I’ve tried. This recipe came from Everyday Food magazine , which you know I love. It has a secret ingredient, which I haven’t told anyone about, because people have such strong feelings about it. We’ve made it two or three times already! I took a batch of this pasta to a Boy Scout banquet last week, and more than one person liked it. A friend of ours even asked for the recipe, which I planned on posting here regardless. We LOVE it. At least Number One and I do. H-Bomb picks out the sausage, Sawed Off picks out the broccoli, they trade and everyone is happy! The text in the magazine says, “Anchovies are the secret ingredient in this dish. They give it a deep, savory flavor without a bit of fishiness, so if you’re tempted to skip them, don’t.” I agree, DON’T. I have actually used an entire tin in one batch of the pasta, although for the banquet I stuck to the 4 fillets. The first time you make this, unless you’re a huge fan of those little fishes, you should probably use 4 fillets. But a whole tin is delicious too! On to the recipe. Enjoy! In a large pot of boiling, salted water, cook pasta according to package instructions. In last 2 minutes of cooking, add broccoli and cook until bright green and crisp-tender. (just cook for the 2 minutes) Carefully reserve 1 cup pasta water; drain pasta and broccoli. Add sausage to empty pasta pot and cook over medium-high, breaking up meat with a wooden spoon, until browned and coked through, 8 to 10 minutes. Remove from heat, return pasta and broccoli to pot, and add oil mixture. Toss well to combine, adding enough pasta water to create a thin sauce that coats pasta (I usually end up using about 1/2 cup water). Serve sprinkled with Parmesan. Santa brought my boys the A Star Wars Cookbook last Christmas, and they have been having a blast with it! So far every recipe we’ve tried has been good, but I think our favorite has to be the C-3PO Pancakes. Yum. I think they would eat these almost every morning, alternating only with Princess Leia Danish Dos (that’s right, they are rolls shaped like Leia’s hair). Not only does the cookbook have good recipes, the photos are particularly inspired. Princess Leia shooting her gun over a pile of Danish Dos, Han Solo squirting ketchup out of the Millennium Falcon onto one of his Han-Burgers. Fun! Buy the book for the pictures, keep it for the recipes! Your Star Wars fans will be ecstatic. Put the butter in a small saucepan and switch on the heat to low. When the butter has melted, turn off the heat. Let the butter cool slightly (5 minutes). Meanwhile, open the cans of pineapple. Drain off the juice from the cans into the sink. Set aside. Put the flour, brown sugar, baking powder and salt in a large bowl. Stir with a wooden spoon until well mixed. Break the eggs into a medium bowl. Add the milk and 4 tablespoons of the melted butter. Whisk until well mixed. Slowly whisk in the flour mixture until well blended. With a pastry brush, lightly brush some of the remaining melted butter in a large skillet. Set the skillet on the stove and switch on the heat to medium-high. Fill a 1/3-cup measuring cup with batter. When the skillet is hot, after 1 minute or so, pour in the batter. Cook the pancake until golden underneath and bubbles burst on the top, about 3 minutes. 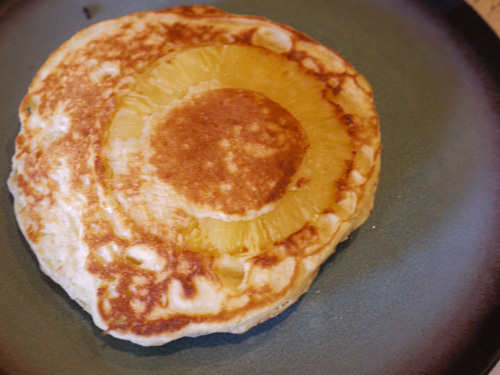 Place 1 pineapple ring in the center of each pancake. Using a spatula, carefully flip the pancake. Cook until golden brown on the second side, about 2 minutes longer. Transfer the pancake to a baking sheet. Using pot holders, put the sheet in the oven. Repeat until all pancakes are cooked, then serve warm with butter and maple syrup. This is a delicious, quick dinner to pull together on a weeknight, or any night you’d like a savory, exotic and nutritious meal. I had a huge chicken breast in the freezer, so I just diced that instead of using thighs and proceeded with the recipe. The rest of my notes are in italics, as usual. I served this with rice. The stew improves with time, so it’s great if you have some leftover. Incidentally, I didn’t remove the cinnamon stick or ginger, I just left it in the pot and in the container we stored the leftover stew in. I will probably try freezing this meal and see how it does. Place flour in a wide, shallow bowl. Season chicken with salt and pepper; dredge in flour, shaking off excess. In a 5-quart Dutch oven or heavy pot, heat oil over medium-high. Add chicken, and cook until browned, 4 to 6 minutes per side; transfer to a plate. Heat 1 more tablespoon oil in the pot. Add onion, ginger, and cinnamon to pot. Cook, stirring occasionally, until onion starts to soften, 2 to 3 minutes. Return chicken to pot. Add broth, sweet potatoes, and, if using, saffron. Bring to a boil; reduce heat, and simmer until chicken is cooked through and sweet potatoes are tender, 10 to 15 minutes. Discard ginger and cinnamon. Stir in lemon juice, and season stew with salt and pepper. While stew is simmering, prepare couscous according to package instructions. Serve chicken stew with couscous, garnished with cilantro, if desired. I first made these wraps last fall, when I was asked to make meals for a bunch of hard-working cowboys, but I realized I wouldn’t actually BE there to serve the lunch. Luckily these wraps hold very well overnight, and always receive rave reviews! I also made them this spring, when we went over to Colorado to meet my friend Nicole who was visiting from Germany. The recipe comes from The Gourmet Cookbook , except I use roast chicken. While the recipe didn’t say anything about the make-ahead-ability of these wraps, I decided I’d take a chance. I’m so glad I took the chance! The wraps were amazing, and got many compliments from the folks hard at work in the corral. I can’t remember how many Nicole and I made in Colorado, but this year I am making 24 wraps total. (yes, I multiplied the recipe by SIX!) And, same thing this year, with boys in school I won’t actually be here to serve the lunch, so I’m doing the same prep that I did last year. I actually made the pickled onions and chipotle mayonnaise on Saturday, then assembled the wraps on Sunday night. I rolled each wrap with one end closed, one end open, then wrapped each one tightly in foil, and stood them upright (closed ends down) in a bowl in a cooler. Also in the cooler was a bag of apples, a couple bags of good chips, and plenty of my Crisp and Chewy Chocolate Chip Cookies in a ziploc bag. You should definitely try these wraps at home! MAKE THE PICKLED ONION: Blanch onion in a 1 1/2-quart saucepan of boiling water for 1 minute; drain. Return onion to pan, add vinegar, water and salt, and bring to a boil. Reduce heat and simmer, stirring occasionally, for 1 minute. Transfer mixture to a heatproof bowl. Cool, uncovered, then refrigerate until cold, covered, about 2 hours. MAKE THE CHIPOTLE MAYONNAISE: Blend chipotle and mayonnaise in a blender or food processor until smooth. MAKE THE WRAPS: Toast tortillas directly on (gas or electric) burners over moderate heat, turning over and rotating until slightly puffed and browned in spots, 40 to 60 seconds. Spread 1 tablespoon chipotle mayonnaise on each tortilla. Arrange one quarter of chicken and lettuce across the middle of each tortilla and top with some drained pickled onion. Season with salt and pepper and roll up wraps. In September, one of my partners was PJ of Seduce Your Tastebuds. PJ and I had been partners before, but it had been a while. I always love being paired with her so I can try totally new things! I previously made her delicious Vegetable Kurma, and did some experimenting with her Meethi Paratha and Homemade Paneer recipes! This time, it didn’t take me long to decide to make PJ’s Chinese Fried Rice. I happily discovered that we actually have all the ingredients, every single one! Well, except for the ginger garlic paste, but I’ve made that before. The only problem, for me, is that many of the ingredients need prep. 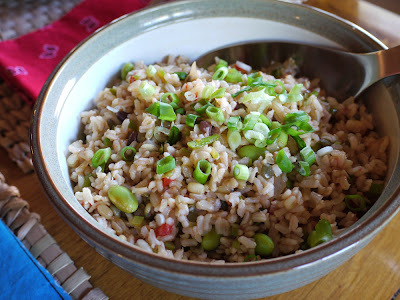 I don’t mind chopping, but you have to cook the rice, boil and shell the edamame, I had to cook my sprouted lentils, make the ginger garlic paste…whew. I used the same pan/lid first for the rice, then the lentils, then the edamame (mine are frozen). But still, all that felt like it took forever. Lucky I even had sprouted lentils in the pantry! I had found and picked up a bag of dry truRoots Organic Sprouted Bean Trio …including lentils, mung and adzuki beans. We’ve been cooking the beans and tossing them on salads, which I love, so I was excited to use them another way. So after everything, this rice is worth it! It is healthy and delicious, I think my dad called it “excellent.” Try this soon!! Heat the oil in a wok on high heat add the ginger garlic paste. Stir once and immediately add the onion and saute. Add the sprouts, edamame and the soy sauce. Keep stirring continuously for a minute and add the cooked rice and lower the flame. Check for salt and add a little. The soy sauce will have some salt so check before adding. Stir and cook for a minute for the flavors to blend. Remove from flame and serve hot garnished with spring onions. Taste & Create is a monthly food blog event, created by my friend Nicole of For the Love of Food. Participants are randomly paired, and must choose and create a recipe from their partner’s blog. It is FUN. If you’d like to sign up, check out How it Works or email me at cowgirlmin07[at]gmail[dot]com by the 8th of every month! I realize I recently posted this recipe on my blog, but it is so delicious I just don’t think it’s getting the attention it deserves. So I’m sharing it over here as well, and I really want someone to try it and let me know what you think! Do you love it as much as I do?? I don’t know if that’s possible. For two years in a row, our cousin Devin made these delicious hors d’oeuvres for us at some point during his and Gina’s visit. I love it when Gina & Devin & the girls come visit! This year, I wasn’t too drunk to pay attention while he listed the ingredients. He only told me the names of the ingredients, mind you, not the amounts. So this is my best guess. A pretty good guess if I do say so myself. If I remember (this is where the wine makes things hazy) Devin and Gina went to dinner at a fancy place in Chicago, where they ordered these hors d’oeuvres, and they liked them so much that Devin went home and created a replica. I made an Artisan Bread baguette for this, but you could buy a baguette at the store, if your store sells baguettes. My store does not. Easy, fast, delicious and even healthy! Make some today! Seriously, I can pack away a lot of these beauties…yum. I used frozen peas, but you can use fresh peas instead. Just blanch them a bit first so the texture will be soft and smooth. Add peas and mint leaves to food processor, along with about 1/4 cup olive oil. Puree until smooth, adding more olive oil as necessary to achieve a nice consistency. Add salt and pepper to taste, I just tossed some in. 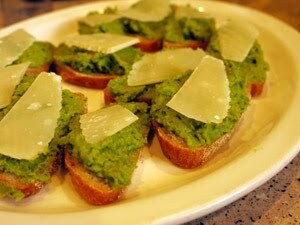 Serve a generous dollop of pea puree on top of each baguette slice, gently topped with a thin slice of Parmesan.